I started learning pottery at the age of 16 in high-school. 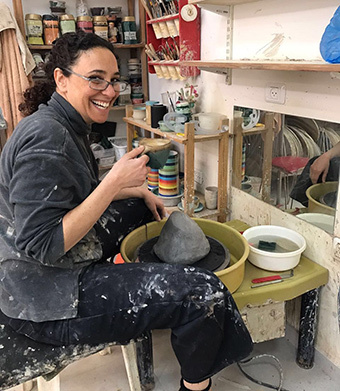 In my hometown, Be’er Sheva, there was only one school that had an art department with a specialization in pottery. 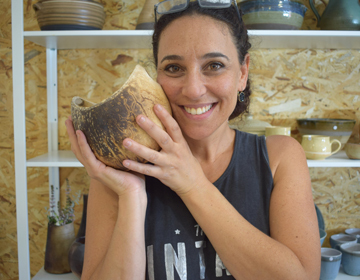 After my compulsory military service, I went on a trip to the north of Israel, and by chanced upon a potter who worked with a potter’s wheel. During our conversation, she told me about the department of ceramics and pottery in Tel Hai College. This was a turning point for me. Shortly thereafter I signed up for pottery studies at Tel Hai College, moved to live in a Kibbutz called Manara, which is located on the border of Israel with Lebanon, and embarked on a three year journey, full of wonderful experiences, where I learned and deepened my knowledge of the secrets of the trade. Toward my graduation, I won a scholarship which took me to Wales, UK, for three months, to serve as an apprentice to Mickey Schlosing, a world renowned pottery artist. Mickey taught me everything about salt Glazing. Coming back to Israel marked the beginning of my Tel Aviv era. 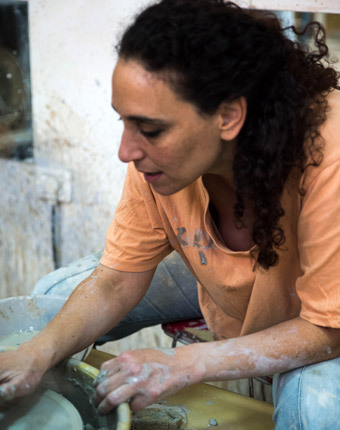 I lived in the culturally colourful South of Tel Aviv, near Yaffo, and started teaching pottery in Ayelet Terlovsky’s Studio. Under her wing and guidance, I developed my teaching skills and techniques. In 2003 I opened a small studio in Hod Ha’Sharon, and started teaching and creating myself. These were years in which my students and I worked close together in my tiny studio, hunched over 4 potters’ wheels. Despite all this, the joy and laughter, the heart to heart conversations and the emotions, mixed together with the clay, left very warm memories in my heart. In 2016, I opened a new and spacious studio in Kefar Malal, where I create and teach today. Indeed, here the space is larger, and the equipment is more advanced, but the energy of intimacy and closeness remains. Students come to unburden themselves of all they went through during their week and the clay sustains all of it. The studio is a home for me, and I do my best to make it a home for all who come to it.